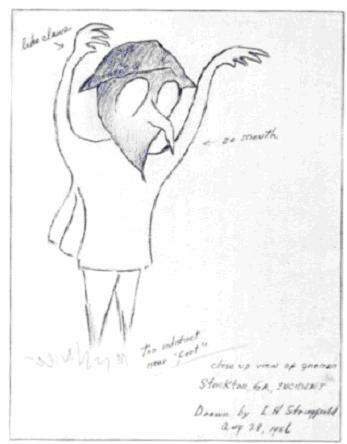 The notations read, from top, "like claws", "no mouth", "too indistinct to see "feet" ", and "closeup view of gnome / Stockton GA INCIDENT / Drawn by (name unclear) Aug 28 1956"
A little while ago, I heard from a very good friend of mine that I talked to in a while. It turns out that since the last time I spoke to her, she’d gotten a job at Travelocity, the trip-planning company. Travelocity’s mascot is a little gnome, which apparently you’re allowed to check out and take with you on trips. I hear the office has quite a collection of photos of the gnome in all sorts of exotic locales. But that’s not the point. The point is, as soon as I heard the word “gnome” I had to bite my tongue to keep from launching into a long story about how some people believe that genuine gnomes exist. But I can only keep such things in for so long, so here we are. The year was 1955. A certain Mrs. Margaret Symmonds and her husband were en route to Florida for, I assume, a summer vacation away from their hometown of Cincinnati. Little did they know that before their vacation in Florida, they’d be taking a detour through both Stockton, Georgia and terror. At around 3:30 AM Mrs. Symmonds was driving, while her husband slept in the back of the car. As they drove, she became aware of four small figures on the road ahead of her. They were around 4 feet tall, gray, appeared to be wearing capes, and were standing together. She thought that she had interrupted the little men digging a hole in the road, since one of them seemed to be carrying a stick. One of the figures moved apart from the group and she got a good look at it: the little man was wearing a slouch hat, had a turnip-shaped head, a long pointed nose and small mouth, huge eyes that glowed red, short legs, and long, thin arms that ended in claws. The notations read, from top: "two background figures were turned backwards and indistinct", "bodybent our slouched" "(unclear) no face visible" "details obscure" and "IMPRESSIONISTIC DRAWING / by (name unclear) Aug 28, 1956"
Naturally, Mrs. Symmonds let out a scream that woke her husband even as she swerved around the little monsters. When she’d calmed down enough to tell him what she had seen, her husband wanted to go back and investigate, but she had had quite enough monster-related adventures for the evening. So they continued on to Florida, leaving the little men to go about their business. 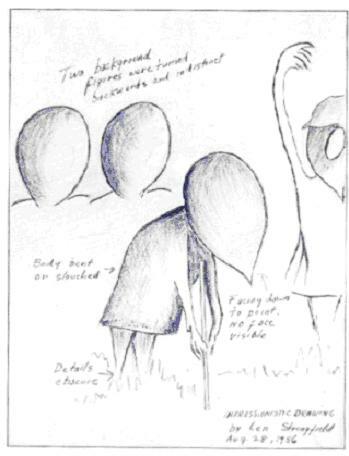 The description of the gnome-men (or dwarves, or goblins, or whatever you want to call them) is similar to a handful of other cases that have been reported, such as the case of the Hopkinsville Goblins, from that same terrifying year of 1955. Generally, gnomes are reported to be about 3-4 feet tall, have short feet that end in claws or suckers, long arms that end in claws, giant glowing eyes, big ears like those of an elephant, tiny mouths and long, pointed noses. In the Hopkinsville case they were reported to have worn silver suits “like metal plate”; a case in Canada claims that the little guys were wearing lime-green jumpsuits. There are two theories about the little gnomes. The first is that they are some type of space alien. The “proof” for this is that they seem to act a lot like the occupants of UFOs – curious in a sort of bored, detached way, they like to engage in what seem to us as pointless activities, and though they’re not aggressive they will defend themselves with great zeal. Occasionally, as in the cases from Hopkinsville or that particular Canadian one, the gnomes are sighted going in or out of flying saucers. A problem with this theory is that sometimes the gnomes are reported when there are no UFOs in evidence, such as in the case of Mrs. Symmonds. This leads us to the second theory: that the gnomes are definitely weird little monsters, but they are weird little monsters from earth, not from outer space. In comic book terms, I think they’d be called NHIs, that is, Non-Human Indigenous, just like the Mole Men from Superman. Anyway, the theory goes that these little guys evolved on earth the same way that human beings did, but there aren’t as many of them and they enjoy their privacy to the extent that they’ve managed to keep their existence more or less secret for all of history. I say more or less because the proponents of this theory claim that all the fairy tales we’ve heard about gnomes and tiny men are real. They were actual events that occurred, and if you’re the sort of person that believes an entire race of tiny men could evolve alongside humankind without being noticed, I guess it’s not that much of a stretch to believe that one of them could have been named Rumplestiltskin at some point. When I said that there were two theories about the gnomes, what I meant to say that there are two theories for those that believe gnomes exist. There’s dozens upon dozens of theories that can explain away the existence of them. The one that I think is most interesting involves owls. I didn’t know it before I started looking up pictures of owls on the internet, but owls are creepy little monsters. When threatened, they can raise themselves up to a height of around 4 feet. 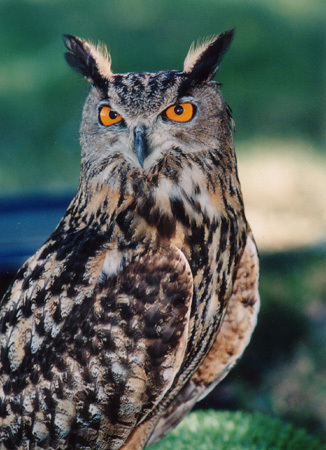 They have tufts of feathers above their eyes that, when they are excited or threatened, fluff up and can look like the brim of a hat, giant ears, or antennae. They have short feet that end in claws, and if they spread out their wings it can look like they are wearing a cape and have claws at the end of their hands. Most importantly, they have giant, orange eyes that, if they catch the light properly, can look like they are glowing. On a country road, late at night, if you got only a quick glance, would you mistake this thing for a Gnome? I probably would. Owls are pretty creepy looking. Am I saying that the Sutton family in Hopkinsville and Mrs. Symmonds in Georgia simply mistook a few hideous, enormous bird monsters for small man-monsters? Of course not. I’ve never met Mrs. Symmonds, I’ve never even been to Georgia, and I’ve only seen photos of owls. I hope never to meet one in person. Anyway, there are some problems with this theory. First, I can’t believe that a family full of farmers in Kentucky would mistake a bunch of owls for space aliens. Similarly, I can’t explain why Mrs. Symmonds reported that one of the monsters was holding a stick. I suppose if she was driving fast and just got a glimpse of the things, she could think there was a stick when there wasn’t, but if that was the case, I don’t know why the owls wouldn’t have just flown away. Ornithologists, help me out here. When I copied this picture from the internet, some wierd message in French came up. I assume it meant something along the lines "owls are incredibly creepy little flying monsters." Let’s look at the big picture. What do we have to show that Gnomes actually exist? We have a few scattered cases where, more often than not, only one witness saw them, usually in the middle of the night in deserted country locales. Which of these two things is more likely: that in the dead of night, after a long car ride, a weary person could mistake a quick glance of some perfectly normal animal for a little gnome monster, or that these little things genuinely exist and have kept themselves secret for millennia? I can’t say for sure what happened all those many years ago on that dark Georgia road. But I can say for sure what is more likely to have happened: a tired person mistook something natural for something supernatural.